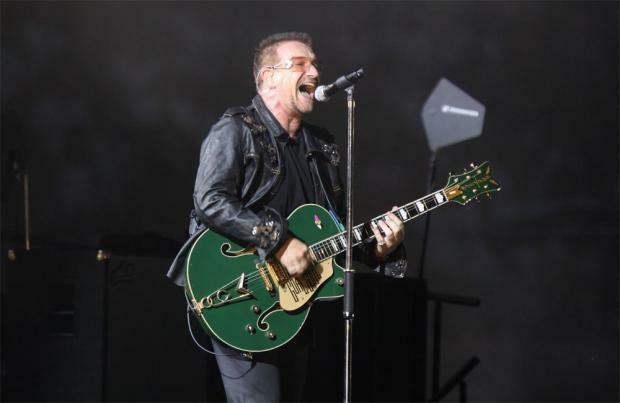 U2 payed tribute to the late Leonard Cohen during a show in Toronto, as Bono dubbed him as "an addiction" he can't "give up"
U2 payed tribute to the late Leonard Cohen during a show in Toronto. The 'Beautiful Day' rockers - comprised of Bono, The Edge, Adam Clayton, and Larry Mullen Jr. - honoured the late musician, who passed away in November at the age of 82, when they took to the stage in the Canadian city over the weekend, as frontman Bono dubbed him as "an addiction" he can't "give up". He said: "Tonight we hold onto some things, as you let go of some others. I'm not quite sure how to let it go, but I know tonight I'm holding onto the music of Leonard Cohen, thinking about it today. It's been on my mind. He's an addiction I'm not ready to give up, so I'm going to sing this one to Leonard Cohen." The 57-year-old singer then urged the 50,000 strong crowd to use their phones to light up the Rogers Centre out of respect to the musical icon - who was born in the Canadian city of Montreal - shortly before launching into a cover of Leonard's classic song 'Suzanne'. He added: "Just think. Think of Leonard. He called us friends. Really, we were just fans. That was okay by me. For Leonard Cohen. Stay with me. That's beautiful. Stars coming out for Leonard. Different part of the country, but you know he loved this city. Stay with me now. I want to try something." And Bono also insisted Leonard was "lucky" to live the life he did, after he told the crowd of a conversation he had with the 'Hallelujah' shortly before his 80th birthday. The 'With Or Without You' singer said: "I asked him, 'Leonard, what do you want to do on your 80th? Have you made any plans?' And he said, 'Yeah, I want to smoke a cigarette.' [I said] 'But you'd given up cigarettes for 27 years,' [and he said] 'I'm just going to have one.' We could all be so lucky to live a life like that."